A vase with fresh tulips are on the dining table, and the blue willow tea pot with matching sugar and milk sit patently waiting to be used. Morgan has chosen the red tea cup found in the cupboard, while I have chosen the regal blue- none are matching – all attest to gifts, birthdays, broken pairs that have tunnelled down through decades to the current china I have now. 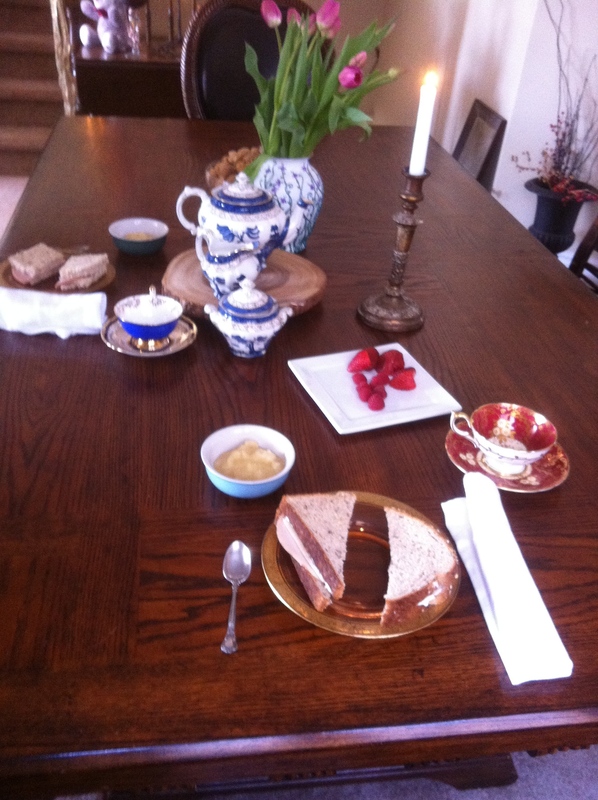 She has a bologna sandwich, and rather than tea she will have some milk. I have discovered that she likes to pour the milk; I allow her this rather than the heavy tea pot- each cup of tea I have in the small teacup overflows with the white liquid. Her eyes lit up and I knew I had found something that I could connect the past with the present. One of my memories of my grandmother and my grandfather were of having afternoon tea with them at Hales Cottage. Cookies would be shared, and the daily news and mail would be read aloud. My grandmother and great grandmother’s journals are always talking about having someone over to tea and visiting others- it was a part of their tradition. I have their teacups, teapots and cutlery tucked safely in their wooden cupboard for safekeeping- it was time to bring them out and share them and with them a tradition. The first day I actually attempted to give Morgan Cambric tea- this is a term my grandfather used- I really don’t know if it is a real beverage or something he made up. It is a combination of a little bit of tea, with a great deal of milk. I wasn’t really surprised that she didn’t like it, but I wanted to give her the opportunity to try it. I remember feeling very grown up when my grandfather presented me with my first tea. I don’t know if I liked it, but I kept taking it on the principle that it was an initiation into a realm of the adult world. So at 1:00 on a Sunday you will know what we are doing- drinking from our overflowing teacups, and sharing some time outside the realm of the madness of everyday life to connect with the past, present and future. This entry was posted in children, Thoughts and tagged Cambric tea, children, Hales Cottage, tea, traditions. Bookmark the permalink. I just checked out Cambric Tea- seems Granddad didn’t make it up. 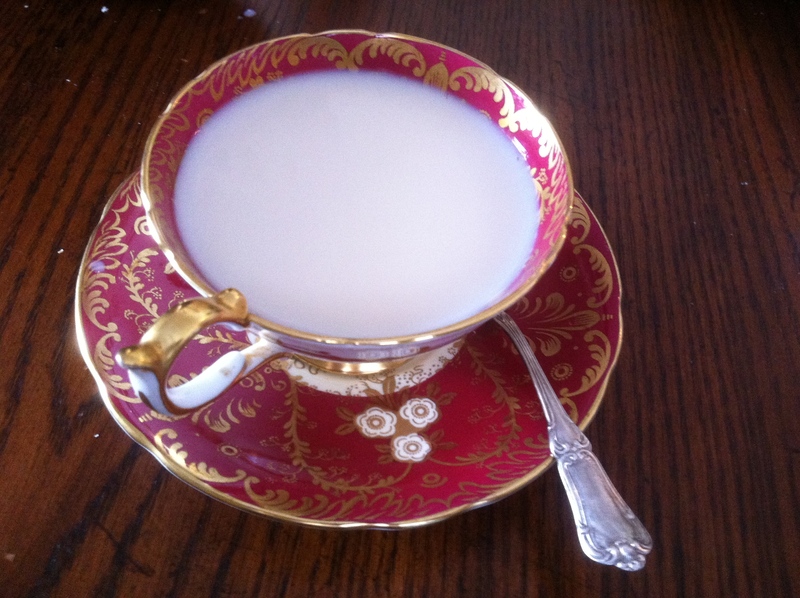 Cambric Tea was a drink of milk, water, sugar and a pinch of tea popular in the 19 and early 20th century. It was named after the cloth made in Cambrai. Ironically enough this posting ties in with the posting I made about Cambrai Cathedral- I didn’t even try to do that! !